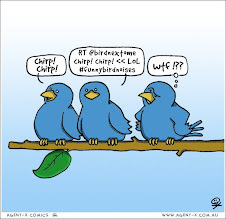 Twittastic! The Evolution of a Love Language. Since I became a Twitter junkie a little over a year ago, I've had to learn yet another new language. Technically, I'm mono-lingual in the traditional sense. Yes, I can ask where the bathroom is in both French and Spanish, but conversationally I only speak English without embarrassing myself. In the online world, however, where I can exist with my avatars as a reflection my residual self-image (thank you Morpheus), I speak several languages, and Twitter is one of them. "I'm so excited to watch #TeamCanada play in the #Olympics today"
"I've been working on this scene for six hours. #NewbieWriterFAIL." Technically this defeats the purpose of tagging a common thread and adding your thoughts to the collective. It does, however, create a cheeky way to add a subtext to an otherwise boring tweet, and if you use Twitter like I do, to ask your community for assistance without having to phrase a direct question. If I were to tweet this, I could guarantee I'd get at least two or three replies and possibly a direct message from my writing community asking what I was struggling with and if they could help. My point is, don't be afraid to immerse yourself in a culture even if you don't understand it right off the bat. If you can handle yourself with an open mind, it will always be worth your while. If there are any questions regarding Twitter Lingo in the future, I'm sure Jeanne and myself would be happy to translate wherever possible. Upon hearing the word “Twitter,” I recoiled. What is a tweet? Who has time to tweet? Why would a serious writer ever participate in such nonsense? I had to find out. Last July, I started my Twitter account, and my life as a writer has forever changed. My name is Jeanne, and I’m a tweetaholic. What is Twitter? Simply put, it’s a worldwide network. We writers are often quarantined, hunkering down in cluttered home offices, strumming away on our keyboards, not seeing another human, or shower, for days. Twitter brings a support system right to your computer screen. Luckily, they can’t see your dirty hair. There I was with a grungy mane and a shiny new Twitter account. I timidly poked around. One of my first finds was a writing chat, called WriteChat. Here, I met a gaggle of writers who held my newbie hand. Their support was astounding. No longer was I alone at my isolated desk in the country. A tweet is similar to a text message. People connect by the voice expressed in 140 characters. Certainly, some judge by the profile picture, but most writers associate with the voice. The character limitation has challenges, but it’s a lesson for writers in editing. Be effective in fewer words. I can hear editors applauding. Chats are only part of the value. People tweet links to informative articles and blogs. Editors, publishers, and agents post their tips throughout the day. Rachelle Gardner was the first literary agent I met on Twitter and has a blog offering endless advice for writers. True, some agents aren’t as gracious, but even that has value. Seeing an agent’s personality, allows us to find a better fit for our own. It’s easier to query an agent you’ve seen as a person, not just a gatekeeper. This kind of access is priceless, yet on Twitter, it’s free. On Twitter, I’ve met writers who have gotten contracts with agents, invitations to participate in anthologies, found editors-for-hire, and even a Dutch writer, posting her blog in English to share with her Twitter community. We read each other’s work and provide feedback with encouragement. Let’s be honest: often our own families can’t supply that. Generosity is abundant. I’ve witnessed writers recommend others to their agents for representation. Even smaller gestures make a difference though. One of my followers encouraged me to stop procrastinating and start a blog. With his advice, and one short day, my blog went live. He tweeted my link as a high-five of support. When one of us succeeds, we all have hope. Tweets aren’t solely professional. Followers become friends. One day, I posted my sorrow regarding a friend who died. The outpouring of love and support took my breath away. Later, when I blogged about my friend’s death, Best Selling author, J.T. Ellison, stumbled upon it. As a thank you, she mailed the first three novels in her series. We became fast friends. Another highlight has been the creation of ScriptChat, a chat for screenwriters. Jamie Livingston, Zac Sanford, Kim Garland, Mina Zaher and I are the founders. The chat’s success has been astounding. One of our regular participants, Clive Davies-Frayne, is adapting his screenplay, SMOKE, as a novel, sharing his journey. As a result, many novelists are now trying their hand at screenwriting. Script Magazine’s West Coast Editor, Joshua Stecker, found Scriptchat and offered to give free subscriptions as prizes. Joshua also joined my writing partner, Douglas Blackmon, and me for lunch to discuss our adaptation. You can’t imagine our surprise when he asked if we’d consider guest blogging on the magazine’s site. The opportunities for connections via Twitter are endless, as are the success stories. However, not all people succeed on Twitter. Some use it as a procrastination tool. Others get too social and forget they came to network. Yet, with a few simple guidelines, you can develop a community of talented, helpful writers to nurture you and your craft. 1. Show your personality, not just your projects. People want to work with someone they like. 2. Tweet helpful advice, articles and websites. 3. Interact with people, including the professionals. Pretend you’re at a cocktail party with conversations going on around you. Join in. 4. Pimp your fellow writer, meaning tell your followers about them. Read their blog. Comment. Tweet it out. 5. Have a website or blog linked to your profile to show your voice beyond 140 characters. 6. Be creative in your bio. Don’t simply put “writer.” Show your layers. 8. Attend agent chats and follow topics where agents, editors, and publishers offer advice. 9. If you have a question or a new blog post, tweet it at different times of day to catch more people online. 10. View Twitter as a part-time job. Dedicate one hour in the morning and one hour in the evening to start your following. You get out what you put in. In case you still aren’t convinced of Twitter’s value, Writer’s Digest publisher, Jane Friedman, met me on Twitter, invited me to a Writer’s Digest party, and asked me to write an article on Twitter's value. If that doesn’t prove Twitter’s worth, I don’t know what will. The writer’s quarantine of solitude is lifted. Twitter is your water cooler. ...to an RSS feed near you.